These are lyrics by Phil Collins that we think are kind of repetitive. 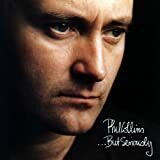 Phil Collins', "I Don't Care Anymore"
I'm having trouble thinking of any Phil Collins song that isn't incessantly repetitive, but this song has 23 instances of 'I don't care' or variations thereof in about 40 stanzas. That's a lot of not caring! Phil Collins', "Something Happened on the Way to Heaven"
How many times can I say I'm sorry, I'm sorry. It just begs us to count how many times he says "I'm sorry", of course the refrain is also repetitive, but you note the "I'm sorry"
Phil Collins', "Take Me Home"
This is half of the lyrics of the song!